My rule when playing Fortnite for ‘fun’ is finish in the top 25. If I don’t manage that it’s a bad game. So despite playing Fortnite almost every day I’d say I firmly fall into the ‘average’ player category. I get a Victory Royale every so often and regularly hit top 10 but I’m not stacking up wins match after match. Still, when Epic started testing a new type of competitive play, known as Gauntlets, in preparation for the Fortnite World Cup later this year I wanted in on the action. These Gauntlets consist of week-long qualifying sessions that all players can enter, which build to a grand final that plays out over the weekend. The difference between these events and the standard ones is that a Gauntlet rewards you with points for eliminations, and your finishing position. It's the latter that's incredibly important to someone like me, as it very much plays to my strengths of tactically moving around the map avoiding almost all the other players until the final circles. After the week-long qualifiers, the top percentage of players then advance to the weekend final, and using my unique strategy I’ve managed to qualify, not once, but twice. Some of you may call it camping but I call it good rotation. At least that’s what I’ve heard, anyway. Here's how it all worked the first time around. At the start of the week, everyone begins on zero points, with the aim of earning points as you play. You get one point per elimination; three points for reaching the top 25; then two more points for top 10; another two points for top 5; and three more for a Victory Royale. So, earning yourself the Victory Royale spot would earn you 10 points, plus a point for every player you eliminated along the way. The catch is though, for every game you play, you must pay the bus driver two points, so you need to keep on performing well in matches to amass a tidy sum of points to carry forward. Paying off the bus driver is a really smart mechanic, as it makes everything into a gamble. You're always going to lose two points just for entering game, so do I risk two points for the potential return of much more? Or do I bide my time and be content with the score I've amassed so far? It makes quite a different to the excitement and pressure of entering, particularly compared to previous tournaments where you could drop at Tilted Towers, get three quick kills, die and repeat ad nauseum to wrack up the points. Now every match matters. It's handy too that you're always matched with players on a similar point score to you for the next round, but that does mean that the better you do, the more likely you are to come up against better players. That's seriously bad news for me. Being the first time this type of Tournament had happened I gave myself a conservative target of 20 points. I had no idea what other people would be aiming for, but figured it’s a good starting point. I should note at this stage that my tournament play is wildly different to how I play normally. In regular games I’m pretty happy running around looking for other players and building structures to protect my position, but in Gauntlets I actively avoid conflict where possible. 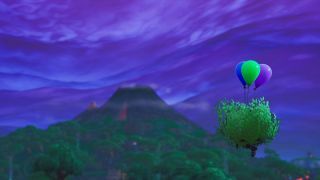 I’ll always land at the furthest point away from the bus route (normally at an unnamed location) and will, for the most part, hug the edge of the storm like it’s the teddy bear in a monkey suit I’ve had since I was little. I knew that earning those 20 points was going to come from my final placement, rather than racking up the kills. I never expected to win any matches, mainly because tournaments like this throw players from all platforms together - there's no way I'm outbuilding someone on PC on a PS4 - which means that, after deducting the bus fair, I’m going to have to place top five in four games in a row to earn those 20 points. The first game was basically the same as playing a regular match. Everyone is on zero points so I was matched with a full range of players, from people giving Gauntlets a whirl, to professionals going for the high kills and Victory Royale combo. Somehow I ended up 5th, for which I got seven points. The next six matches were a combination of sneaking my way around the map, and getting the occasional elimination, but there were also a few times where I got too cocky and dropped into a hot landing zone where I’d be immediately killed and lose two points off my total. Those matches made me feel a bit sick. I haven’t found a game that can rival the intensity of the final few circles in Fortnite, and playing through with this additional pressure all the damn time genuinely put me on edge - all for the sake of a few virtual points. But after getting to a total of 19 I decide the quality of players i’m now being matched with and the risk of not getting into the top 25 means it was time to stop and hope for the best. I was actually quite surprised to learn that it was enough to put me in the top 3% of players and I’d be playing in the weekend finals. Well, I would have, except I got the time scheduling wrong and missed the first session. On to the next tournament! But, there's already an issue, as for the second tournament Epic has confused everything by changing the rules. This time around you get two points for reaching the top 15 rather than the top 10 and now the qualifying players will be entered into a $100,000 finals event over the weekend. So now there's money at stake. And we all know what that means - more players trying to earn more points, which makes qualifying (and my life) a lot harder. But that last tournament taught me quite a lot about how these events work. I noticed that just surviving until the first circle will get you to the top 25 or near enough and the next rotation will almost guarantee you points in every match. Hiding is the new meta, right? Surviving until the end though gives you much more of a feeling of what it’s like to play at a pro level, with upwards of 20 people surviving until the smaller circles and having to make those tactical moves to cover in the confined space. It’s super stressful, to the point when I have to take a break after any match where I reach top five just to give my nerves a rest. I’ll admit that creeping around the edge of the map is the most entertaining way to play or watch, but with a potential prize of $100,000 up for grabs I’ll do whatever it takes. Because of this new points structure I actually ended up getting more points this time around finishing up with 28 points, which again puts me in the top 2%. To give you an idea of just how ‘average’ that is the top player had 601 points. But they played 94 matches compared to my nine so who’s the real winner? Yeah, it’s them, I know. So there I was. In a Fortnite tournament with real money on the line. The Scallywag cup had a slightly different point scoring system. You don't have to pay the bus driver and points are awarded for top 12, seven, and three placements and a Victory Royale. But what wasn’t mentioned during qualifying was that this was a Duos Only tournament - despite having a full week of qualifying for both Solo and Duos. Because I don’t have any friends as devoted to Fortnite as I am, I desperately fired out messages to see if anyone wanted a shot at some of the prize money and eventually GamesRadar’s Video Editor, Brandon, stepped in. We’ve played together quite a lot and, if i’m honest, he carries me through most duo matches. Things were looking up… until we tried to play together. Firstly Brandon didn’t have Two Factor Authentication set up which is something Epic requires you to have to play in tournaments with money involved. But after waiting for 30 minutes for the email we were ready. Expect we weren’t because Brandon hadn’t qualified himself so was now ‘ineligible’ to play with me. After a week of qualifying, hours of practice and rearranging my weekend to play the closet I got was the lobby screen. But that doesn't negate the fact that I managed to sneak into two Fortnite Tournaments and be among the top 3% of players that entered just by hiding my way to victory. Judging by the current tally of how many people play Fortnite, that may well be in the millions but it’s a pretty impressive sounding stat nonetheless. This tournament structure is by far the best Epic has tested so far and despite all the stress and walks around the garden to calm down I did enjoy it. Which is good, because there’s another one this weekend.